It has been a year since we installed our eco-roof, so let's see some before and after pics and then learn how it's going and share the pros and cons of the project and its outcome. To recap, this is what it looked like before the eco-roof was installed, this photo is from the fall of 2012. One of my first posts covered it in detail, if you are interested in the step-by-step and plant list, read about it here. Some benefits of eco-roofs: They manage storm water, protect streams, cool cities and clean the air, conserve energy, save money and provide habitat for beneficial insects and birds. But mostly, they just look cool and hey, it's an excuse to plant more! We also feel it visually balances the back garden. 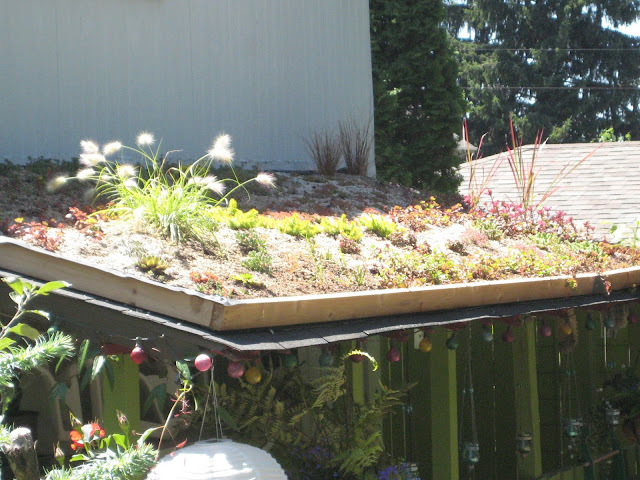 For more information about eco roofs and resources, check out the Portland Ecoroof Program or the Ecoroof Handbook. Finished roof a month in. Here's a stitched-together image of the whole roof. Pretty cool! Here are some views of the roof while standing on it. I had to weed, so it was a good opportunity to snap a few photographs. Filling in nicely! Some sedums have spread more rapidly than others, which is to be expected. Here is the second eco-roof, on top of our garden shed. It's hard to photograph this one. Here's a bit more of a close-up, slightly different plants, some yarrow, native grass, sedums and a some Zauschneria, or California fucshia and a Penstemon pinifolius. Both the zauschneria and penstemon have taken a bit more time to establish themselves, but I think they will be fine. This second eco-roof sits directly beneath two large evergreen trees in the neighbor's yard, so rainfall is not as plentiful. This has definitely made a difference, so I have added more drought-worthy plants than I did on eco-roof number one. This newly created area acts as an absorbent garden for runoff from the eco-roof above and is filled with shade plants, most native to the Pacific Northwest. Just for fun, since I'm so seldom up there, here's the view of the garden from on top of the eco-roof. I've been asked if it's a lot of work to maintain, and also about drawbacks to an eco-roof. First of all, it is virtually no work to maintain. I have gone up on a ladder to weed about three times, each time taking about three minutes to get about seven small weed seedlings. Really. I know others might be in the line of fire for more weed seeds, but this is honestly what I have had to do to maintain it. I have added a few starts of sedum to the second eco-roof, and also taken off a lot of Douglass fir litter from the neighbor's tree, but that again has been just a handfull of times. The first several months after installation we had to irrigate on really hot days to get things established, but since then have not had to. It has grown in nicely. Birds pretty much ignore it, the bees love it when the sedums are in bloom. The squirrels surprisingly avoid walking on it, they prefer the hard surface of the strip of roof we left untouched just at the top of the roof for access. We've touched on the benefits, how about the drawbacks? The cost can be prohibitive to some, we did it really low-budget, so the overall cost was worth it for us. The most expensive thing was the soil, and you do not want to pinch pennies there. Get a good quality soil like we did from Sunmark Environmental. The other drawback? We didn't do it sooner. It has added so much visually and is just really cool to have way up there. It's little to no maintenance, it was designed to be this way. Eventually, in 10 or so years we will likely have to replace some of the wood frame, but the soil is designed to last for a very long time. I hope this little tour of our "rooftop garden" has been entertaining! If you have one yourself, please let us all know how your experiences compare to ours. If you have questions, please feel free to ask away, many people now have eco-roofs and are happy to share the knowledge, as we are. Your roof garden looks so pretty and all is growing so well. Such a pity I have not a suitable roof for I should like to try this too. My goodness it is just gorgeous!!! Bravo to you for all that you do!!! I am just amazed by these before and afters...your whole garden is just stunning! Thank you! thank you thank you. It's a lot of fun, we all do it because we love it. Here's to gardeners everywhere! Your roof looks amazing. I must say that your efforts can be really seen in these pictures, just see how an ordinary roof changed into something this beautiful. I have shingle roofing in my house at Oakville. Can you tell if I can do something like this with that? Thank you for the kind words, Melissa! I don't know if you could do this or not, I don't see why not - it all depends on the slope of the roof, I think. If you click on the link to the Portland Ecoroof Handbook in the post above, it talks about this. You just need to make sure it's all structurally sound - if you're doing it on a house, rather than an overhang, I would recommend getting a professional to at least look at your site and make recommendations. All it is, really, is a waterproof liner inside of some kind of frame, something for the plants to grab on to (we used a plastic mesh), growing media and plants. There are lots of other configurations with special trays that snap into place with layers of soil, foam, plastic, whatever. That's on the elaborate end of things. Ours is simple and it works just fine. Go for it, keep us posted if you do it! I am a succulent whore so...okay wait. That sounded really bad. But you get the idea. I love succulents and so any excuse to grow more of them has me listening. Your roof looks so awesome. What a fabulous undertaking. Thanks for sharing! No, that sounds about right, I'm the same, Grace :) LOVES me some succulents! Thanks for the kind words! I say go for it, really. It's just a bit of planning and a bit of labor for a day but man, the rewards are worth it. Inspiring progress report on the eco-roof. I'll bet it provides just the needed nudge for many people. Your garden looks fabulous seen from above. Thank you Ricki! I hope it does give a friendly nudge, it's really pretty straightforward and adds a lot of green to the scene! Thanks for your compliments!! 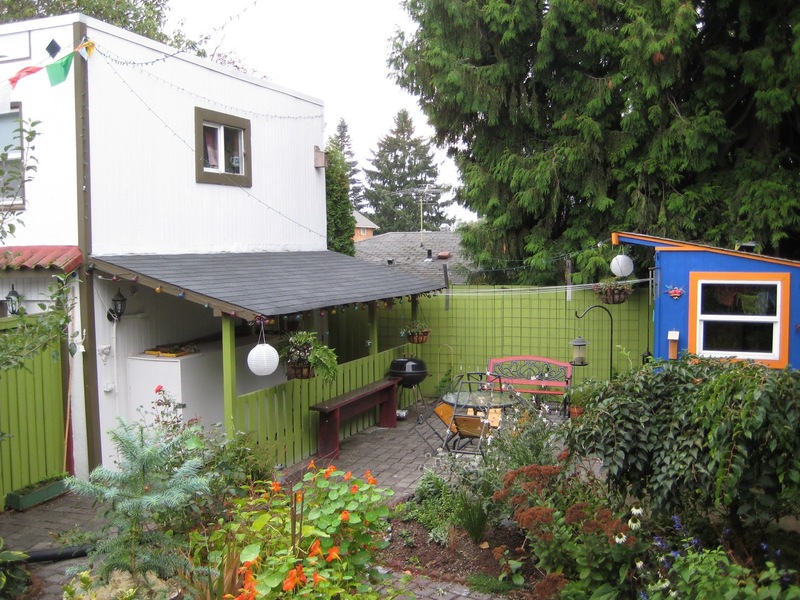 The rooftop garden looks sweet, and I love all your colorful paint choices too. Thank you Pam! I love the colors it has taken on, to be sure. Thanks for reading!